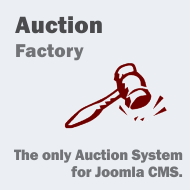 Auction Factory is a unique Joomla extension that allows you to create a professional auction website. You can unleash the power of a fully fledged Auction script and also take advantage of Joomla's unmatched versatility. Having a fully customizable templating system, webmasters even without any PHP knowledge can easily modify the look of any page in our extension. There is no need for the webmaster to change the extension's code, and this will ensure a 100% upward compatibility with our future releases. Just back up the template folder and all of your customizations will be safe. The Auctions Factory Package includes ALL PHP sources (nothing encrypted) and one set of generic templates (commented in the files - for a better understanding) along with a full documentation of the templating system (available under documentation in our website). There are several supported auction types: regular auctions, regular auctions with bin price, bin only auctions, private auctions. Users can bid regularly or by proxy (proxy bidding is also known as automatic bidding) and can also enable price suggestion, which will allow bidders and sellers to have a more vivid bidding conversation. With a fully customizable mailing system you can ensure that users get the notifications regarding their activities in your auction site. You can enable or disable any notification and change its contents. The pre-installed Payment gateways allow you to turn the auction website into a profitable business. Standard Auction: Sellers list their items and the start price, buyers place their bids on the item and compete with each other. When the auction ends, the best bid (highest bid) will be automatically chosen. Standard Auction with Buy-it-now price: Sellers list their items and the start price and a buy-it-now price for the item, buyers place their bids on the item and compete with each other. If at any time a buyer clicks the Buy-it-now button, the item will be instantly awarded to that buyer. Private Auction: Sellers list the item and the start price, buyers post their bids without having information about other bids. This type of auction is also known as "sealed envelope auction"
Buy it now Auctions: This type of auction resembles the classic multi-vendor shop, where the sellers post their item with a fixed price, and buyers get awarded just by accepting this price. Additionally, you can enable "price suggestion" for this auction - this allows the bidders to send their price offer to the seller (maximal 3 suggestions per auction) and if the sellers agrees, then the bidder might get a lower price than the BIN price.